Almost all of the praise was premised on two assumptions: A) Trump presents a horrific risk to the planet and B) Clinton is the antidote to this, a “steady hand” in a dangerous world. Point A, it’s worth emphasizing, is true. Trump’s Muslim immigration ban and his claim that climate change is an “expensive hoax” that was “created by and for the Chinese” are certifiable and racist. His plan to seize the natural resources of other countries reverts us back to outright 19th century colonialism. His violent and inciting rhetoric presents a clear danger to immigrants, women and people of color. But B, the idea that Clinton is, by contrast, a prudent foreign policy moderate, is an establishment media assertion with little or no supporting evidence. Clinton has a long, objectively verifiable track record of acting recklessly on matters of foreign policy that seems to have slipped into a memory hole as the prospect of a Trump presidency looms overhead. While one would expect this rewriting of history to come from Clinton surrogates, it’s increasingly bizarre coming from nominally independent media pundits. But at the end of the day, even though real estate is a game for risk takers, it’s also a game where the downside risk is very limited. At the absolute worst, you can’t repay your debts and it becomes a bit harder to get a loan the next time. Running a country isn’t like that. If you make a big mistake, you can’t just go to court and have the slate wiped clean. A casino bankruptcy hurts the bottom line of a few banks. A sovereign default of the United States — something Trump has floated — would destroy the global economy. But “wiping the slate clean” is exactly what Iraq War boosters have done. Bush and Rumsfeld are currently playing golf, while those who supported the war, like Clinton, continue to hold positions of power. Clinton issued a belated and perfunctory apology—and that was it. And that’s just the one “mistake” she’s been called to answer for. Clinton’s support of a right-wing coup in Honduras, or the disastrous regime change in Libya, are seldom brought up, much less apologized for. Perhaps Yglesias is referencing the material consequences to the world, rather than to the politician, but if this is the case, then why not address the hundreds of thousands of dead Iraqis resulting from the war Clinton pushed? Why not bring up the disastrous government she forced upon Haiti? 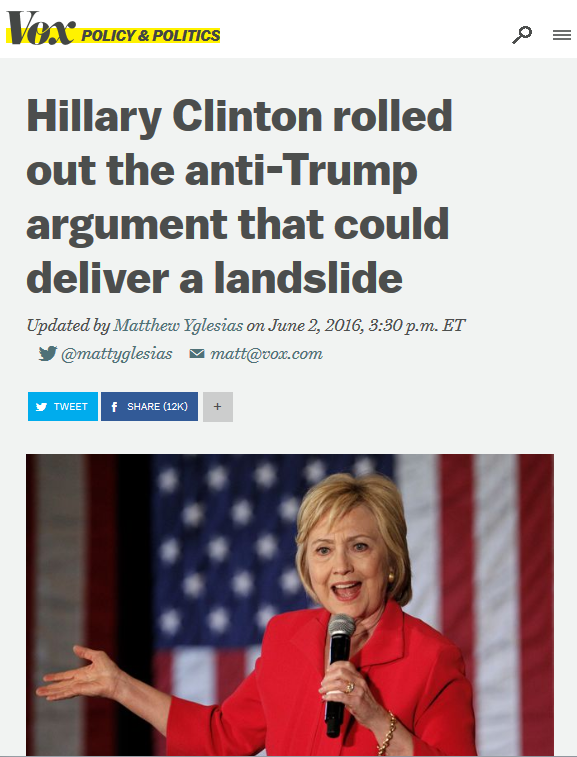 Yglesias is right: The stakes are high, and, time and time again, Clinton has made decisions that resulted in material harm. Slate’s Fred Kaplan and Bloomberg View’s Eli Lake also neglected to mention the Iraq War when recapping Clinton’s “experience.” It could be because they, like Yglesias, also pushed for that particular disaster. Indeed, as we’ve seen before, to indemnify Clinton for her past “bad judgments,” is to do the same for most of the pundit class who also followed Bush off the cliff. Her rebranding is their rebranding. This may serve immediate political interests—especially if one views Trump as existentially dangerous—but it doesn’t serve history, and it certainly doesn’t serve readers. The media has a duty to vet the foreign policy record and plans of the respective candidates. As such, the pundits are right to pinpoint some of Trump’s more dangerous plans. Where they’ve consistently fallen short—and this was on full display in response to Thursday’s speech—is also contextualizing and harshly critiquing Clinton’s brand of measured, polite recklessness. On this we have some pretty stark examples. The right-wing coup Clinton backed in Honduras in 2009 eventually led to the assassination of indigenous leaders and displacement of thousands of Hondurans as they fled right-wing violence. One email from her aide Sid Blumenthal in March 2011 informed then-Secretary Clinton that a Libyan rebel commander told him that “his troops continue to summarily execute all foreign mercenaries captured in the fighting.” (“Foreign mercenaries” being code for black Africans loyal to Gaddafi). In response, the State Department continued to support the rebels without any clear concern for their war crimes. A BBC report that December detailed how 30,000 black Libyans were ethnically cleansed from the town of Misrata. A report the following year in the New York Times detailed how US arms “fell into the hands of jihadis” in an effort to overthrow Gaddafi. Clinton’s eagerness to back dubious groups in the interest of regime change wouldn’t stop there. For years, the State Department watched Qatar and Saudi Arabia arm jihadists in Syria while pledging millions to overthrow the Syrian government themselves. Time and time again, Clinton’s desire to overthrow unfriendly governments resulted in arms “ending up in the hands” of designated terrorist organizations. As for the former Secretary’s famous “wonkishness,” there’s evidence, as Peter Beinart noted in The Atlantic in 2014, that Clinton didn’t even review the NIE report on Iraqi weapons of mass destruction before voting to authorize the war in October 2002. Unlike Trump’s rhetoric, these were actual reckless decisions that affected real people. Of course, media should critique Trump’s outlandish, ofttimes cartoonish campaign promises. But they don’t have to whitewash Clinton’s foreign policy record to do so.